When Floyd fans think "Boston," it's likely a specific radio personality comes to mind: Matt Leonard, aka 'The Doctor.' 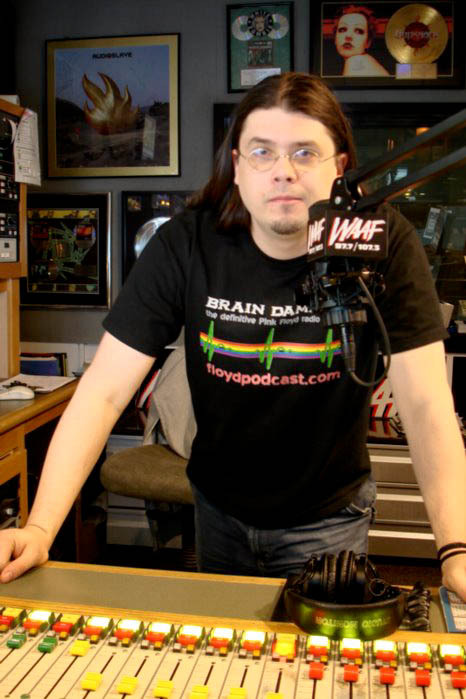 There's no stronger intersection of Boston's culture and Pink Floyd than Leonard, who in addition to hosting the internationally recognized Pink Floyd podcast since 2005 also boasts on-air time at Boston rock giant WAAF. Raised in Foxborough (sometimes spelled Foxboro), a Boston suburb where Pink Floyd performed on each their 1988 and 1994 tours, Leonard has been at the heart of Boston's rock scene for some time now and has established himself as the go-to person for Pink Floyd history and news in Beantown. I met Leonard at Boston's Beer Works, a watering hole in the shadows of the city's most famous arena: the TD Garden. The Garden (or as Leonard would say in a thick Boston accent: "the Gahden") has probably played a big role in his life: not just because so many historic bands have played there… but because it's a sacred place of sorts for Bostonians and New Englanders in general – largely on account of the professional sports teams it hosts. As a fellow New Englander by adoption, I have a great appreciation and respect for Leonard's work as well as a visceral familiarity with many of his life experiences. As a Floyd fan, WAAF fan, Pink Floyd podcast fan, and as someone who loves Boston, I was really looking forward to the chance to speak with him in person. This meeting had been in the works for months, and despite our geographic proximity, it wasn't until Roger Waters' "The Wall Live" hit Fenway Park – the cathedral of baseball parks, where he and I have each worshipped with regularity – that we had the chance to cross paths in person. With all that in mind, and away from the pounding drums, fireworks, soaring guitar chords, and the huge fete that a Waters "Wall" show turns into, we sat down on a quiet Boston afternoon to mull over a number of questions and to discuss the Pink Floyd podcast. Leonard's Pink Floyd podcast traces its roots back to 2004, when a friend urged him to put together a "Pink Floyd radio show for the station" he was working with at the time (Tufts University's WMFO). Although "reluctant" because someone else was already airing "a Floyd radio show," that show's hour-long format struck Leonard as restrictive. 'Echoes' clocks in at 23.31: add commercials, and do the math. Not impossible: but a lengthier format promised different results. So Leonard saw a niche, leapt in, and really developed his own style and approach: one key thing Leonard was seeking was a chance to play more obscure tracks: this is one crucial reason fans keep listening to his podcast in increasing numbers. "Eight months into the show, I left the station and decided to turn the show into a podcast. I built a studio from the ground up and taught myself how to do it, and I've been going at it since." Leonard feels the podcast allows him "to do pretty much anything" with formatting. He feels a syndicated version of his podcast "on terrestrial radio" probably wouldn't allow him to do much of what he does now: "I'd have to stick to the same, officially released material and unofficial recordings would be off limits. Compelling content would be more difficult. It's possible. I'd still have fun, but being an underground podcast has its advantages. I get to enjoy a lot of freedom." Any fan that has discovered unofficial recordings like "A Tree Full of Secrets" or "Would You Buy a Ticket to This Show" can understand the value and appeal Leonard's format. Since we met just a few weeks after Waters' Fenway Park show, it almost felt like we were meeting as a massive storm had settled, or as two of the last few people left in a room after a huge, historic event has ended – when the balloons, streamers, and confetti are reduced to things that need to be 'picked up' rather than as what added texture and grandiose to the affair. This must be the way roadies feel after the last show on a tour, when everything is packed up – and it's a sense you can only discern with a fellow fan. The first thing I had to ask him was whether he played any instruments. "I dabbled with drums," he says. The simplicity of his answer was enough for me to realize I wasn't talking to a frustrated-musician-turned-fan. So the next logical subject was how Leonard came to be known as "The Doctor," his radio moniker. "I signed on every show with 'Comfortably Numb,'" says Leonard. "It was my signature song. This was before I knew that 'The Doctor' was the working title for 'Comfortably Numb.'" "And for other reasons I won't get into (laughs)!" "The Doctor's" presence in the Boston area is palpable beyond Floyd fan circles. There's no question Floyd related events or shows always heighten his profile further: in 2011, when Waters was about to visit Boston for the first time on "The Wall Live" tour, Leonard became a center of attention – his encyclopedic knowledge of Floyd history, and particularly the details he can recall on the band's historical presence in Boston and New England, have served him well – resulting in interviews on regional television channels and eventually, when Waters returned for his stadium tour leg, being tasked with a daily blog leading up to the historic Fenway Park show where I had the chance to meet him for the first time. Given his interest in, and knowledge of Pink Floyd, I have to ask the obligatory question: how did Leonard get into Floyd? He tells me it started "around the time I got the 'Another Brick in the Wall' single" but that he "really got into Floyd in 1983." Regarding "Another Brick on the Wall," Leonard explains: "My grandma knew I took a liking to the song… she got the 'Another Brick in the Wall' vinyl single for me at Good Vibrations – the record store, here in Boston." Leonard explains that this was before things cemented fully in 1983: "I saw 'The Final Cut' EP video on MTV. I remember the image of the car going under the bridge, driving – I could see the military guy standing. 'The Final Cut' video was a set of four tracks from that album. Actually, the teacher from 'The Wall' is in this 'Final Cut' EP video: the main character in the film, which was directed by Roger's cousin (referring to Waters). Then some years later, the 'Learning to Fly' video was out." Leonard, it turns out, is part of a newer generation of fans that grew up – at least for the most part – through the Gilmour Floyd era, which makes my next question particularly poignant. A question that requires little context for the most devoted fans and which can be particularly delicate for the host of the Pink Floyd podcast: Gilmour, Waters, or Barrett? Leonard sighs (long pause): "Wow. For a long time, (David) Gilmour… during 'A Momentary Lapse of Reason' and 'The Division Bell' he carried a lot of weight on his shoulders; he's a shy guy and doesn't like being the focus of attention. I have sympathy for how long he tried to keep Pink Floyd together – being constantly in the spotlight and all." Somehow, Leonard's response evokes an element of self-description. Over time I've made a few friends in the radio industry and Leonard seems to embody one of the most curious traits shared by many of these: an almost English sense of quiet dignity, which is very much the way many perceive Gilmour but probably not the way you'd prefigure an American radio personality. Ironically, radio personalities tend to be boisterous on the air, and perhaps even among close friends. Yet somehow I get the sense that Leonard's view of Gilmour and the guitar player's time leading the band is genuinely sympathetic. He seems to relate personally to Gilmour's endeavor, and it might be a commonality in personalities. "I'd ask: 'what was the best thing you took away from the Division Bell tour and why were you so hesitant to do it again?'" A fair question and one that many fans might feel compelled to ask for different reasons: some because we feel there was more material to be produced by Gilmour's line-up and others because they wanted to see the band churn out more tours to play the classics; for many fans, a simple combination of both. For Leonard – it seems to be something deeper, and even disappointment, at some level, that the show didn't go on. It's a difficult regret some of us wrestle with: the fact that so few years of Floyd's history as a band were within our grasp. And so it has been up to folks like Leonard to carry the banner forward in a unique respect. Excepting the solo tours, the only true full Pink Floyd reunion in 2005, the occasional re-issues, or book tours, an enterprise like the Pink Floyd podcast tends to be among the few consistent sources providing a sense of connectivity between the band and its fans. It's a huge weight to carry – which may be another reason Leonard's way of relating to Gilmour is palpable: especially in light of the challenge presented by today's radio format, which tends to overlook niche programming in favor of "the flavor of the day," repeating the formula over and over until the next "flavor" comes along. Leonard first leapt into radio at Dean College in Franklin, Massachusetts. Since receiving that single as a gift from his grandmother, and in tandem with a growing career as a radio personality, Leonard began to absorb Floyd history on an epic scale. When I ask him for a tidbit of Floyd history in Boston, it takes him no time to dig through his mental archive and mention that in the early 1970s the band played at Boston Tea Party: a venue housed in what used to be a synagogue and later moved to what would become Mama Kin Music Hall (a venue owned by Boston's own Aerosmith) and which went through several incarnations before becoming what is now the House of Blues, right across the street from Fenway Park. Although that show predated Leonard's time, he has managed to put quite a few under his belt: "I've seen 21 Waters shows, 16 for 'The Wall' alone. I've seen Floyd five times and saw Gilmour once at Radio City Music Hall." As with many Floyd fans from our generation, the most nostalgic memories of the band date back to those shows that took place after the two albums produced under Gilmour's helm. Leonard elaborates: "I first saw Pink Floyd on May 6th and 8th of 1988 – during the 'Momentary Lapse of Reason' tour. Then I saw them on the next tour – Division Bell." "Few people might remember that they were the first band to play consecutive nights in Foxborough – this was a really big thing. Three nights in 1994! There was a local ordinance that bands couldn't play consecutive nights. When Pink Floyd played they were granted a permit to play consecutive nights. I think by that time Bob Kraft (owner of the American football team the New England Patriots) had owned the stadium and he had cleaned things up – things were more organized so there was that sense of ease that they could pull this off. I remember asking one of the town selectman after the 1988 tour…" Leonard pauses… "I think I asked him shortly after the 'Division Bell' album was released and they announced the tour, whether there was a chance that Floyd could play consecutive nights. Who knows if that had any influence?!" Leonard has seen the band or related acts in Chicago, New York City, Denver, London, "and about a dozen other cities or so." In his travels, he has made it a point to visit historic Pink Floyd sites as well: "Grantchester Meadows – that's the sacred crown – the Mecca of Floyd – considering that Gilmour grew up right there. You have to walk by his house to get there. When you go you have to listen to the song. As the song is going, it's describing everything in front of you. I saw a rowboat too. I was with (Brain Damage UK correspondent) Simon Wimpenny and he said 'Look Matt, a boat!' I almost jumped in… but I didn't want to get in trouble! I wanted to row just like in the 'Signs of Life' video. You really get a feel… something about the essence of Floyd's music – an ingredient you can't put your finger on – when you go to Cambridge. You get the vibe and you understand why the music is like that. 'The Division Bell' captures it perfectly too." During this interview's follow-up questions, I gathered Leonard actually sat relatively close to my wife and me during Waters' 2011 London O2 Arena shows. In fact, I have an ambiguous recollection of another Red Sox hat in that audience on one of the nights that I was there: this is quite an emblem of camaraderie for Bostonians and New Englanders. While sitting front row on the third London night, a roadie from Boston recognized my Red Sox hat, we shared some small talk, and by the end of the night he handed me a piece of the Wall that ended up becoming the surface for a Roger Waters autograph I would collect more than a year later in Hartford, Connecticut. Leonard is a devout Red Sox fan: the convergence of the twain is part of Leonard's appeal as a radio personality. In a sense, Leonard is Floyd's Boston branding "in the flesh." Some fans are also very fortunate to be in the right place at the right time, and Leonard is one of them – a fact that has served him well in a sojourn that has resulted in a collection of great anecdotes. "I was putting a bumper sticker on my car; it was a sticker from the local radio station. I heard this unusual sound… it was a different sound: not like airplanes, this was different. When I looked up, my jaw dropped: it was THE blimp – the Division Belle blimp. I jumped in the car and followed it to Mansfield Airport, which was just a few minutes away, and got pictures!" As fate would have it, Leonard had witnessed the end of the blimp's own story: "Interestingly, that was the last tour appearance for the blimp: after those flights over Foxborough it was flown back to a facility in North Carolina for maintenance where it was eventually destroyed in a thunderstorm." Leonard's lasting impression of those 1988 and 1994 shows was strong but never narrowed his ability to appreciate what was forthcoming or to appreciate Floyd music on a smaller scale. In fact, Leonard has actually developed a preference for shows in smaller venues: he wishes he could have seen Pink Floyd in 1987 when they played in Providence, Rhode Island, which was a smaller, arena show. During the most recent leg of Waters' "The Wall Live" Leonard has made an effort to catch the show in the smallest arenas, like Albany, New York: one of those rare shows between stadium gigs that were meant to draw the artist closer to audiences in smaller cities – gigs that were executed in much smaller venues than the stadiums the artist was otherwise selling out. For Leonard, these smaller gigs were a real treat and he found them more compelling. I ask him how he feels "The Wall Live" compared to Floyd in 1994 – and sit back as I detect he's pondered this as much as I.
Leonard takes a sip from his pint, leans in, and says: "You know…. I was thinking about that during The Wall at Fenway. Very good question. 1994 was an incredible production – bear in mind Windows 95 didn't even exist back then. Given all that, it blows your mind they put something that huge together for that show. But with the technology that we have now, 'The Wall' is what it is… 'The Wall' surpasses Floyd's show in 1994. Even theatrically. 'Hey You' was better during 'The Wall Live.' With the wall up, the context is right. So that's something that really had an impact on how I viewed the two shows." "Roger has definitely reclaimed the legacy he was trying to hold on to when he left Floyd. There was animosity in 1994. Not as bitter as before 1994, but there was animosity. He's reclaimed that legacy." It's impossible to divorce opinions on these subjects from fans: all fans have their preferences and views, on each band member, and the way their respective efforts have unfolded. It's insightful to hear Leonard's opinion on these issues because it's probably not the type of subject matter he can delve into in his podcast – after all, he is serving an audience that spans every kind of fan, with very type of preference and allegiance. "No. I get irritated when people say it could happen. Richard Wright was hugely responsible for a great deal of the band's fundamental sound – it would be difficult to replicate." I push him on the issue, asking whether Harry Waters and Jon Carin could fill that void to any degree: "it's possible but it would be weird: it would diminish Richard Wright's contributions; it was weird when Led Zeppelin reunited at the O2 Arena with Jason Bonham. Jason Bonham is great – good drummer – but it didn't feel right." On Ed Sheeran's performance of "Wish You Were Here," which took place during last summer's London Olympics (with Nick Mason on skins) Leonard doesn't hold back: "I thought it was awkward." So I ask Leonard, what is it about Pink Floyd that you feel captivated your imagination more than most other bands you might listen to? "Sometimes when you feel there's nothing in your life that understands you, you can connect with Floyd's music. Everything they touch on is based on things you're always consumed in – few bands have that or convey that. On a Floyd documentary, a journalist pointed out that Floyd was 'music for the disappointed,' that the band members were spokesmen for 'the disappointed.' I thought that was dead-on. As far as what the members bring to that: Pink Floyd music is like the warm blanket – almost makes you feel good – like everything is going to be alright. Richard Wright was a quieter type – if he heard my Podcast he'd think I'm crazy for doing it (laughs). I relate to David Gilmour the most, musically – he's the mood. Waters is more the attitude: the conscience of the band." Given his appreciation for the different personalities that made Floyd what it is, it's no surprise Leonard identifies strongly with an album where the parts began to fray. "'Animals' is their most honest album. That's when the anger started to boil – they were getting numb to the game, egos coming out, the emotions are alive and well – each standing out on its own." In many ways, I can relate to Leonard's appreciation of how each piece worked well in the aggregate. That appreciation for what each band member brought to the table has definitely informed and shaped the way we hear, perceive, and understand music. No matter where Leonard or any of us has stood on which band member played the most crucial role in the band or what period was their best, we can all agree there was a crucial point when we all converged as fans and, much like the band, put our differences behind: Live 8. "It was all too short-notice to go to London. Even if I could have, I don't like big crowds like that… one reason I didn't go to Quebec City for 'The Wall.' I prefer the smaller venues. I was in my living room, running 10 minutes late for my shift on the air. It was getting late and I'm like 'OH NO! I gotta go!' So I was calling the on-the-air DJ telling him I was gonna be late. I recorded the whole thing, so when I got to the station I had the recording with me. I noticed that on the playlist they had 'Comfortably Numb' – so I aired the Live 8 recording from that same evening. I called my manager to ask – and they were like 'Yeah! Definitely, play it!'" Leonard wasn't expecting rumors of a Pink Floyd reunion at Live 8 to materialize. "When the announcement came down that they were gonna do this I didn't think it would ever happen – that Gilmour would come around. It seemed impossible…"
I'm sure fans were grateful Leonard was set to play the Live 8 version of "Comfortably Numb" right away, and I know his fans in Boston and around the world appreciate all the obscure material he plays on his podcast (one of my favorite bits was a recording of sound-check for "The Wall" at the Garden). Leonard has much to look forward to in 2013. With Roger Waters going back on tour in Europe it will be interesting to see what type of things he digs up for his show. It's also likely his audience will continue growing given an escalated interest in Waters and Floyd. "The podcast is still going strong. I do wish the podcast was a full-time thing. I ask for donations and they come in because it's a complex production effort… it'd be interesting if I could work something out with Floyd management to expand that effort – to make it something more formal." New fans would be well-served to go back to the show's first editions – they can go all the way back to September of 2005. There were several reasons I looked forward to meeting Leonard – I'm definitely one of those fans of his Pink Floyd podcast that can understand the convergence of his interests in Floyd and the Red Sox. Floyd grew on the two of us pretty much over the same period of time. We were fortunate enough to see Floyd live in what ended up being their last tours. We've visited many of the same places, looking for many of the same things, particularly when it comes to the band's history. All that said, if there's one thing that really struck me about Leonard it's that he's surprisingly reserved: what the fans get to hear on his podcast and the radio may be what most, perhaps excepting closer friends and relatives, get to hear of him on any given day. Given his trajectory in radio and the amount of fans that procure him to understand the band a little bit better, I have a suspicion his grandmother would be very proud – and I am left to wonder to what degree she understood how that gift so many years ago may have shaped his path more than anything else. Frankly, I bring our meeting to a close with a sense that there are a few more subjects I could really delve into with Leonard and that despite the very different paths our lives have taken, so much has been shaped by the music we are deeply interested in that I can sense the commonalities might even surprise him. I also sense for now this might be as much as I can get. What is the ONE question about Pink Floyd someone should be asking you? "I could talk for hours about Floyd. Many of my friends understand it, but I don't have people to geek out with (laughs)." Check out his podcast – I suspect that's where many of you will be able to see – or hear – the most personal side of Matt Leonard. You can hear Matt Leonard and the Pink Floyd podcast by visiting floydpodcast.com. You can also follow the show's posts at facebook.com/floydpodcast. Pictures: (1) (Official Matt Leonard headshot). (Photo courtesy of floydpodcast.com). 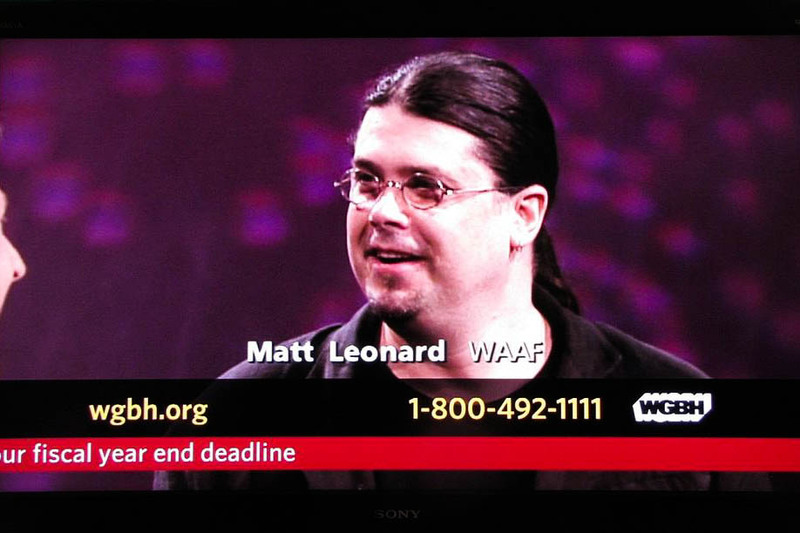 (2) "Matt Leonard being interviewed by Boston's WGBH TV station before Waters' show at the TD Garden Arena." (Photo courtesy of Matt Leonard). 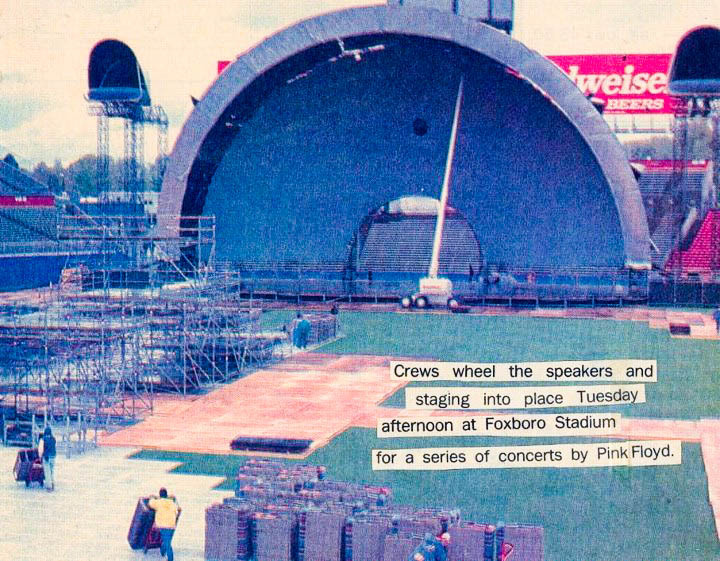 (3) "Photograph (with caption) of Pink Floyd's road crew assembling the stage in Foxboro, Massachusetts, on May 17, 1994. The photograph made the front page of the Attleboro Sun Chronicle on May 18, 1994." (Photo courtesy of The Sun Chronicle and floydpodcast.com). 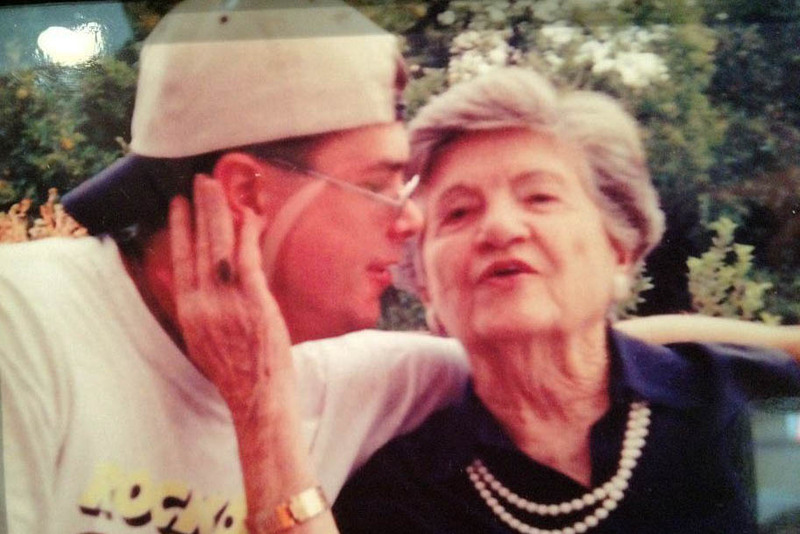 (4) "Matt Leonard with his late grandmother, whose purchase of a 45 RPM single put Leonard on a path toward a career in radio." (Photo courtesy of Matt Leonard).